Official report from Permanent Secretary to Ministry of Information George Charamba implies that President Mugabe will undergo a minor eye surgery in Singapore. Zimbabwe‘s President Robert Mugabe. (AFP)This is among the many trips Mugabe has made to the Asian nation since year 2000 when West imposed travel restrictions on him. Unless Mugabe is going for surgery on a more serious matter, does this mean that Zimbabwe lacks qualified surgeons to correct cataract disorder? Has Mugabe run down Zimbabwe’s health delivery system such that he cannot trust his life in the hands of his compatriots? Assuming that Mugabe and his advisors think he will not get better medical attention in Harare, the accumulation of costs to Singapore this far should have been able to improve Parirenyatwa General Hospital to any standard in the world. On the cheaper option, he would fly those specialist doctors to Harare at a fraction of the cost of a return longhaul flight. What is the cost of such a flight to his health given his age? Zimbabwe is passing through serious liquidity problems despite widening multi-currency regime to include half dozen international currencies. International lenders have refused to extend credit lines until the southern African nation services its national debt which is estimated at between $10-13 billion. Singapore and the surrounding islands & waterways are many miles away from Zimbabwe for Mugabe to fly for “eye cataract “surgery. Given President Mugabe’s level of intellect , it is doubtful he would make or authorise such irrational spending. The only logical explanation is that Mugabe suffers from a more complicated ailment which even South African medical prowess could not be able to attend to. What does Mugabe’s gesture mean to the 13 million citizens who have to surrender their lives to a health delivery system the first family does not trust? To the contrary Nelson Mandela for all the period his health mattered, at no time did he seek attention in UK or USA until his death. Mugabe failing to trust the health delivery system he presides over is a no news in Africa. In 2012 when former Malawi President Bingu wa Mutharika died of heart attack in Lilongwe, his body had to be flown to South Africa even though burial was a week later. Malawi was having severe power outages and the main hospital, Kamuzu Central would not been able to preserve his body until burial. 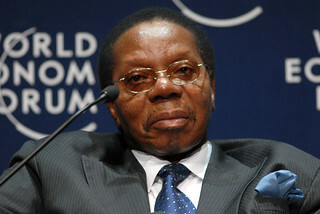 Late Bingu Wa Mutharika – World Economic Forum on Africa 2008.He presided over a health delivery which would not be able to preserve his corpse for more than a week. Reuters reports that President Robert Mugabe is in Singapore for an eye operation ahead of his 90th birthday on Friday, a spokesperson said, maintaining a government denial that Zimbabwe’s long-serving ruler is suffering from prostate cancer. “This is a routine check-up, a routine cataract operation for his left eye whose date was set down more than a year ago and the president has gone out to fulfil that appointment,” Charamba said on Tuesday. A June 2008 US diplomatic cable released by WikiLeaks, said Mugabe had prostate cancer that had spread to other organs. He was apparently urged by his physician to step down in 2008 but has remained in the job. He denied charges by his opposition rivals that he rigged the election and that he remained in power since 2000 through violence and cheating. Critics say Mugabe, revered in his first decade in power as a liberation hero and a pragmatic leader, squandered national goodwill by clinging to power and turning one of Africa’s most promising economies into a basket case. Mugabe said his continued stay in power was aimed at advancing the aims of the liberation struggle for black economic empowerment, such as his policies of seizing white-owned commercial farms for blacks and forcing foreign-owned firms to surrender majority shares to locals. In private, some in his Zanu-PF party grudgingly accepted that Mugabe manoeuvred himself into a position where he could end up president for life, a position that critics say he wants as security against possible prosecution for rights abuses. Posted on 18th February 2014 by newsafrica. This entry was posted in Africa, Democracy, Economy, European Union, Headlines, Health, Human Rights Violations, Leadership, President Mugabe, South Africa, Zimbabwe and tagged Africa, George Charamba, Harare, Mugabe, Robert Mugabe, Singapore, WikiLeaks, Zimbabwe. Bookmark the permalink. « As 110 killed in Borno,Nigeria, we ask-who is Boko Haram?